Wanted to share an update on my timing issue/resolution/new unrelated issue. So followed the steps on the tech page regarding timing with the vacuum gauge. When I connected the gauge and started her up i was getting awful and concerning readings but as she began to warm up it was steady at 18-20 (i do not remember exactly). When I started adjusting the mixture screws to my untrained ear it felt like nothing was changing but the vacuum was steady so I was content with that. I then went to the distributor to adjust the timing and again almost no change on the vacuum gauge dial. I think got it the car to take it for a spin (mistake). It made an awful scraping type noise on acceleration and was not running well. I then took out my timing like to check the timing and I was very very advanced. I brought it down to 6, what the engine calls for, and it ran great. I would still occasionally hear the scraping noise but only on acceleration and only when the car was not warmed up. So I felt pretty good about. 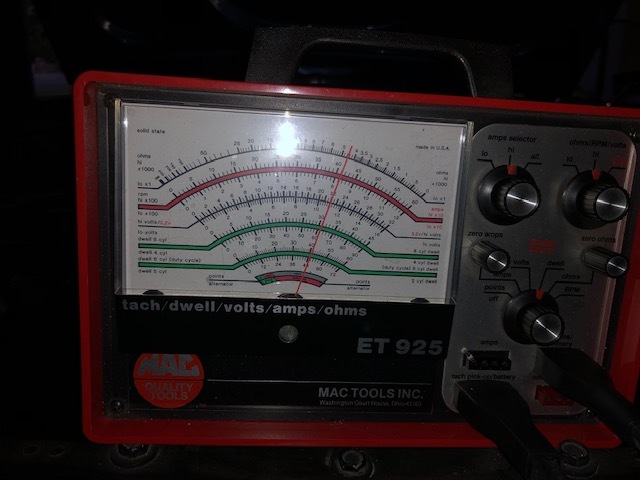 Anyone able to clue me in on that scraping noise or why my vacuum gauge reading was unresponsive? EDIT: I forgot to add that I am spitting out black soot out the exhaust on warm up, which is relatively new. I am thinking it is a little rich. Any advice on this would be helpful as well. My new unrelated issue is electrical but I will post that elsewhere. I don't have any idea of your scraping noise, can you make a video of it? On the engine tune though, these are the Factory tune up specs for a 1968 Ford Mustang 200 Six with an Auto Trans. Point gap base setting is .027, the best setting though is 38 Degrees Dwell. Base timing for Auto Trans is 12 Degrees BTDC. Curb Idle RPM is 550 in Drive with parking brake set, Air Conditioning if you have is off. If you have or can get ahold of a tach / Dwell unit,Timing Light, you can start doing the tune up. Over the years I found this is a good order to work from to quickly dial in a good basic tuneup. 1. Fist set your Spark Plug Gap to .034 and then install the plugs. 2. Set the point Dwell to 38 degrees. 3. Next set your Base Timing with Vacuum line to Distribitor disconnected and to 12 degrees BTDC. 4. Assuming that the carb is in good condistion and the float level is set correctly plus the Distribitor vacuum line is hooked back up. Then the next step is to set your carb mixture to the lean best idle, the starting setting after a carb rebuild is usually 1 1/2 turns out. With a tach hooked up and engine warmed up to normal operating temp, plus check that the choke is fully opened up then reinstall the air cleaner assembly check that the air filter is clean too. Turn the mixture screw in until idle speed drops slightly then turn the screw out until you reach highest idle RPM then turn the screw back in 1/4 turn (Leaning it) this is your lean best idle setting. 5. Last set the Curb Idle RPM to 550 (in Drive with parking brake set and the AC is turned off. 6. If the carb still has all the working choke parts then it now needs to be set also. Auto choke is set about 2 index marks past center Index Mark to the Rich side. And with the fast idle screw set on the fast idle cam index Mark (>) you will want to adjust screw so it's from 1200 to 1500 RPM or just a high enough RPM so that the car when cold will drive without stalling. 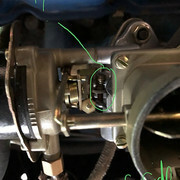 When warmed up choke should also release the fast idle cam and return to the normal curb idle and choke blade should be fully open. Recheck this setup after the engine is cold again to see if the choke resets itself on the Fast Idle cam and the choke blade closes. For the best results I usually repeat steps 4, & 5, just to verify that the carb settings are right. You know the tune is good if the car starts when warmed up without touching the gas pedal! This should give you a good basic tune up to adjust from and fine tune it since every engine can like a slightly different tune. You can then try molding the tune some (do only one thing at a time though) until you find the sweet spot that your engine likes. Remember if you change base timing then you will also need to reset the carbs Idle Mixture and reset the Curb Idle again. If you run into any problems were something doesn't work right in the tuning order then stop there and let us know what happens. Good luck in your tuning! You're going to have to elaborate on this "scraping" noise. If it's coming from the engine that sounds bad, real bad. It can be easy to over time them by ear. But you could easily set the timing to 10-14 without much concern of causing any problems other than gaining more power and pep. Ok guys thank you for the awesome replies, as you always do. Couple things. I was thinking I had an electrical problem but I do not think it is that anymore. Once the Mustang gets warmed up she dies and will not restart unless I really give her some gas. At one point I tried restarting her and she was completely dead, no lights or anything. The next day, she starts right up. I have attached links to 3 videos below. 1st video is the odd scraping sound I hear when I start to decelerate after accelerating (not just simply accelerating). The second video is of the vacuum gauge I have hooked up to the car and I am giving it gas, nothing seems to be wrong here. The third video is the tail end of the Mustang sputtering and dying. I am really scratching my head on this one. I will likely follow Bubbas steps 1 by 1 because I think something is off with the tune. i wont get to that until tomorrow or Saturday though. This is quite strange. You might have to get the tune up right before can really tell much more. There could be an off chance that the starter drive is maybe sticking and is staying engaged with the flex plate. Try removing the starter and checking it out good to see if the drive is moving freely and that the drive unit isn't damaged. I am having some trouble hearing it so maybe somebody else will recognize this sound. You can also use a broom stick handle or a mechanics stethoscope to listen and pinpoint / find where it's coming from. On it stalling after that you then aren't able to restart it and having to wait until the next day to restart it, which it then restarts so it appears to have healed itself during the night! On the no power electrically, get your test light & start at the battery & test down the rest of the electrical chain from there. You need to see how much advance is in your distributor, both centrifugal & vacuum advance. From there you need to do a distributor recurve if necessary so you have enough advance, but not too much. The only time i use a vacuum gauge is in conjunction with an A/F tester to set the curb idle close to the lean edge while still retaining a decent idle. Follow Bubba's recommendations on the grinding noise. So it is most definitely flooding. I pulled the plugs and they were black and wet. I was able to snag a tach dwell meter per Bubbas suggestion and had some time to hook it up and test it out. Still getting used to the ins and outs of it but I took a picture of it see below. Looks like I'm at 40 degrees dwell, if I am reading it right. I did not have enough time today to set the dwell. I will continue to follow the steps Bubba has listed. Thanks for the support. First Merry Christmas to all! Update I believe I found the culprit and feel a little dumb. I adjusted the screw in the photo below thinking it would help my idle speed when the engine was warming up. However, I adjusted the screw so much that it didn't contact the plate. The photo shows it adjusted where it contacts the plate now. Would this cause the engine to flood when the engine warmed up? PS - GB500 thanks for the tip it helped me set the dwell. So I followed the steps from bubba and she is running a lot better and does not stall when warmed up. Also, no more black soot at the exhaust so thank you very much. I am still getting that odd noise but not as bad. I really think it is related to the timing. I will have to make another video for you guys to hear the sound again.